Japan’s Chugoku Electric Power Company is going to begin reclamation work in an inlet in Tanoura, Kaminoseki-tyo, in Yamaguchi prefecture to construct two nuclear power reactors of 1,370 MW capacity each. This plan started in 1982 and many local residents have been opposing it for 27 years. Every week there are over 1000 demonstrations against the power plant. People in Iwaishima are also refusing a large fishing settlement. 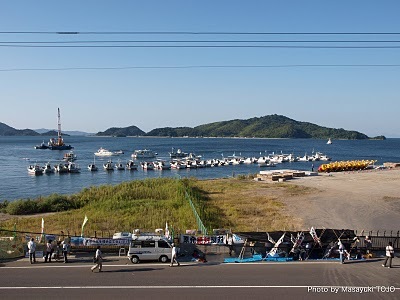 To prevent reclamation in the inlet of Tanoura, many fishing boats from Iwashima and the kayak corps have kept watch over the movements of Chugoku Electric Power Company's work ships every day for the past 3 months. Preparation for reclamation work has scarcely proceeded . During the protest movement, a member of the kayak corps was injured and brought to a hospital by ambulance on November 8th. Chugoku Electric Power Company is responsible for this incident. ・ Please stop forcible reclamation work. ・ The nuclear power plant is dangerous. The problem of nuclear waste cannot be solved. Japan should stop nuclear power plant construction and utilize more natural energy. ・ Please cancel the Kaminoseki nuclear power plant construction project.